I read that he is going to have a big show in Colombia this year, he went there last year and decided to start relationship with his natal country. Not sure if he is going to take a different collection than the one he will show in Paris or some new for Colombia. How ever I think that to be close to his roots can be very positive! 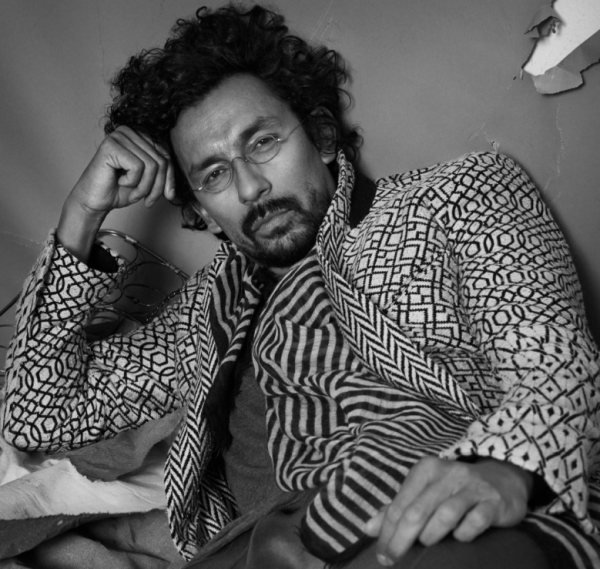 I love my work but I'm not one of those designers who needs to be noticed," Haider Ackermann confides. Many would disagree. In the past few years the designer has gone from an emerging talent to a fashion star that everyone wants. Right in the middle of Paris Fashion Week, the Haider Ackermann showroom is packed. Buyers are busy filling orders, while models navigate the tiny aisles dressed in floor-sweeping coats and tailored separates. In the corner sits a pensive, solitary figure, quietly observing the scene around him. He looks out of place among the glamazons with his dark unruly hair, rounded spectacles and yards of fabric draped around his neck. It's only when people greet him excitedly that you realise that this is the man behind the elegant creations that line the racks. "Now that my show is over I just want to escape. Being a designer is so different now. I don't think it's necessary to show yourself everywhere, or be a part of everything. This is not something that intrigues me. I don't understand things like Instagram. Why do you need to keep the audience updated about your life? I don't see the point. Who would be interested in my life in the first place?" Many would disagree, especially in his case. Ackermann's name has often been bandied about in recent years, especially when there's been an opening at a big fashion house. First it was rumoured that Martin Margiela asked him to take over his brand when he retired, then he was apparently up for a role at Givenchy. In 2010 Karl Lagerfeld famously told Numero magazine that Ackermann would be ideal successor for his job at Chanel. When Galliano was ousted from Dior, the press insisted that he had the job until it was announced that Raf Simons had taken the role. "My name was placed with so many houses - it felt like I had many lovers. At a certain point it was annoying as it was disrespectful to other people. I found it hard, because everyone had something to say. "It was so sad when Mr Galliano left Dior. I would love him to come back because he is the person that made me dream. Not many people can do that. If people carry us away and make us travel with our minds it's such a luxury these days. We are not able to do that any more," he says. Travelling has been a big theme in Ackermann's life - both personally and in his collections. Colombian by birth, he was adopted by French parents whose work took him to exotic places such as Africa, where he was raised until the age of 12. It was his memories of women in countries such as Ethiopia, Algeria and Chad that sparked his fascination with fabrics and draping. "I was always in those countries where fabric played such a huge role. Women were always wrapped up in metres of fabric or covered and hidden behind it, so it was also very mysterious. It was more the curiosity and the movements of fabrics that I was interested in. It was the mystery that lured me in," he says. At 17 he moved to Amsterdam, before ending up at the Royal Academy of Fine Arts in Antwerp to study fashion (he said he chose the city because he was in love). Unfortunately, the school's regimented schedule didn't suit him, and he left early even though his tutors, including Raf Simons, recognised his unique talent. "I never decided to go to school and neither did I finish it. People ask me all the time when fashion came into my life, but things just come to me and I don't question it. It's difficult to do interviews, because I am the most boring person," he says, jokingly. In 2002, he launched his own collection in Paris with a small show. He forgot to invite buyers but that didn't stop industry insiders such as Lane Crawford fashion director Sarah Rutson from attending and snapping up the collection. From the outset, there was something beguiling in Ackermann's languid draped silhouettes which featured an elegant yet edgy mix of sculpted leather jackets, trailing blouses and androgynous tailoring. You could sense wanderlust in his exotic shapes that brought to mind Japanese kimonos or robes worn by women in North Africa. Then there was his amazing sensitivity to colour with a palette that ranged from rich desert hues to vibrant jewel tones. His collections are made all the more evocative thanks to his emotionally charged presentations. Ackermann composes his shows like a musician, often starting with a slow tempo before reaching a crescendo. "The emotional connection in the show is the music, the lighting, the hair, the make-up. When I start a collection it is part of a whole fantasy. I fantasise about her life - clothes are just part of the process. Some designers concentrate on the clothes and you can see it, like with Rei Kawakubo. But for me perhaps it's more about a global atmosphere and feeling," he says. It makes sense then, that Ackermann starts each collection with a story, preferring to write words in a notebook rather than sketching. This approach has resulted in a woman that is strongly connected to him and his personal life. "I think she has become more mature, and is now closer to me than she's ever been before. Before you are in search of yourself and so is the woman, but now I feel I understand her more. It's become less complicated to dress her. She's more in my family now. At the same time I don't know who I am, so how can I describe her? "The egocentric in me means my work relates to my private life, so sometimes you will see lots of colour and other times it's different. I know I am searching for elegance but to define that woman is not interesting. It's more interesting to explore her," he says. This exploration came to a head in his recent autumn-winter 2014 collection, which is more austere than past collections. Free of his usual drapes and twists, Ackermann stripped everything down by including more masculine tailoring in the form of wide-legged trousers and floor-sweeping coats. The palette was subdued with shades of grey and taupe while he also introduced knitwear and easy pieces like the funnel neck grey jumpsuit made from a menswear fabric. "This one started with colour then it changed. I wanted simplicity, soberness, purity. I wanted her, in her masculine attitude, to find some graciousness. I was searching for the word grace - masculine is always heavy with strength and force. I really wanted to have this heavy feeling and in between there's this lightness. It's easy and feels comfortable. Sometimes I am scared she will be too bourgeois," he says, laughing. Looks from Haider Ackermann's spring-summer 2014 collection. Interestingly, Ackermann says that his woman changed most when he relaunched his menswear line. His first foray into menswear came in 2010 at the Pitti Immagine trade fair in Florence, but the line disappeared soon after. Last June he decided to make a comeback with a collection that featured silk jacquard bomber jackets and waistcoats, in his signature jewel tones. While there are connections between both lines in terms of aesthetic, Ackermann says he prefers the menswear. "When you are working with men it's more an exercise of style because you are focused on the clothes. I tried to choose fabrics that were too heavy for me, that I wouldn't wear, to make it different and challenging. Men's is nice - it's newer and everything is much smoother. Even at the presentations the crowd is different and more relaxed. For me I feel I can breathe," he says. This breathing space has done wonders for Ackermann as his collections have grown from being cult favourites with editors to a commercial success. He boasts a mile long list of stockists worldwide, including Joyce in Hong Kong, who will be hosting the designer's trunk show next week Wednesday. The obvious next step would be more lines or even a store. "I want to know more about the business; why one piece sells more than another. My favourites always sell less. "Suddenly this season, I am also thinking about opening stores. Another thing I would love to explore is haute couture. I know where I'd do it, the music, what it would look like. I don't forget these things - they haunt me every night. Sometimes I feel I have a pile of ideas that I am keeping aside because I can't use them [for ready-to-wear]," he says. With the future holding so many possibilities, one wonders what sort of legacy the Ackermann is looking to leave behind with his work. "I won't be remembered. We have amazing designers like Cristobal Balenciaga, Coco Chanel, Madame Grès - those are people to remember. I am living in the moment, doing what I like to do, searching for something, and clothes are the way I do it," he says. "I don't know what else to do if I wasn't a designer. I would have loved to be a ballet dancer. I like any kind of job in which anyone can escape. I do this job to escape from reality. To escape a certain part of myself." Thanks for posting. Would love to see him do an haute couture collection. Despite being fashion's darling for a number of years, not to mention garnering a loyal celebrity and art following, most notably Tilda Swinton, Columbian-born designer Haider Ackermann's line still feels intimate. Like a club not marked by exclusivity, but by affinity. Everyone is welcome, but you either get it or you don't. There is an unapologetic luxury in Ackermann's work, to the point of decadence, as if his ideal woman (and more recently, man) spends her time lounging around in pyjamas so elegant that she need not bother changing when she finally goes out in the evening. Well, maybe she'll throw a sharp-shouldered jacket if she must. Even a pedestrian material such as cotton jersey takes on a new meaning when Ackermann simply adds a silk ribbon to it. The message is the same - a kind of cultivated laziness that comes not from sloth but from the luxury of not having to deal with quotidian existence, its routine and banality. Another thing that prevents Ackermann's clothes from being ordinary is his masterly use of colour. His hues are so rich they negate any trace of the gauche in the clothing. When that satin is done in eggplant and olive, it is toned down just enough to hit the spot. Adopted by French parents at a young age, Ackermann travelled the world as a child. So the rich and vibrant colours come from his worldly experiences in Africa and the Middle East. In a way, Ackermann's work is refreshing, because it makes no apologies for high fashion. All this makes you wonder if Ackermann spends his days in detached, aristocratic aloofness, which could not be further from the truth. Energetic and clever, for this designer, perfection is boring and imperfection is worth exploring. Just after his first ever men's runway show, for S/S'16, I sat down with the designer to talk about his luxurious, colourful world. People usually talk about fashion as change, but often things that last are more beautiful, would you agree? Yes, and it is also the same when everybody talks about luxury. Luxury is not something you should throw away every season, or that you change every season... There is a kind of an intimacy and longevity in it. You have developed luxury that is specific to you, in a way that is very relaxed, nonchalant. How do you find that balance? It is very strange because, especially in the men's collections, there's too much noise. When men are being admired, when all those men are immaculate and perfectly dressed, it makes me want to be one of them. I would like to be properly dressed and I would like to be exact and sharp in my appearance. But I am not one of those men. When I dress, I want to put the garment on and everything is here with me. It's basically a part of who I am. I'm not an anxious person. I have to feel at ease to feel comfortable. /\ Thanks, Ahimsa. For those of you who don't want to read twice, I will publish the extended version Monday on StyleZeitgeist magazine. My girlfriends close friend has interned for him in the past and by all accounts is a gentleman, who treats his interns with respect. A rarity these days in the industry unfortunately. Website super-broken for anyone else? Using Firefox, and it doesn't work at all. Looks like Haider is up to take over the creative director helm at Berluti, as they look to enter the ready to wear arena. Seems very plausible, as there was a post on Business of Fashion advertising for a creative director role for his label recently, I assume to take over for him, whilst he moves on to another house. I hope this doesn't mean his work suffers for his eponymous line. HA has been a relatively new revelation to me whereby I purchased several of his items, like l/s shirt and cropped leather trouser with gathering details. These items caught my eyes and lead to purchase without much background knowledge. Turned out to be excellent buys as I do love his style. HA is one of the few designers that I got excited over recently. And thanx for posting the interviews as I feel more close and expanded my HA knowledge. I absolutely love Haider. Him, Rick, and Ann are my favorite fashion designers. Haider killed it last night. What a beautiful start to the Paris fashion week!